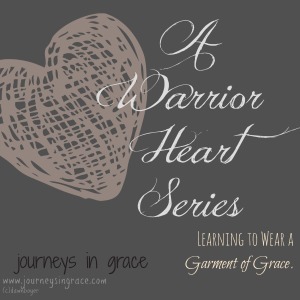 The next post in the Warrior Heart Series: Learning to Wear a Garment of Grace, comes after a quiet conversation with my gentle and introspective friend, Tarissa, from Introverted Mama. Please take a moment to stop by and visit Tarissa at her welcoming place of grace filled goodness this week. We are talking about the topic of the power of mercy when it meets us in our unbelief. It seems timely to be talking about taking off a cloak of unbelief to exchange it for the cape of mercy. As always, I am asking you to continue the conversation at the end of the post with questions and thoughts of your own. I would love to hear from your heart on this topic. Wearing grace is as close as opening a door, choosing a garment, and clothing ourselves intentionally. These garments we wear blow and cover us in our lives; to shroud us sometimes for good and others for protection, sometimes keeping us from seeing hope as it should be seen. Ultimately, the dynamic we wrestle with is like age old question, is the glass in front of us half-full or half-empty? The answer always reveals what we fully believe to be true. Unbelief is a deceiving article we sometimes choose in our daily preparations. It can be a trap for our emotions and our hurts to circulate and fester within. It holds us back, limiting us in such a way that we are running and running but end up going nowhere. Unbelief takes a huge emotional toll on our thoughts. We roll it around in our minds, sometimes, we even play with it contemplating its power over our days. Like a deceptive truth, which applies a filmy gauze over us so that we see things slightly out of focus, unbelief limits our perception of reality. How do we discard this veil of unbelief, more like a cloak that is heavy and overwhelming, and exchange it for the mercy-cape that falls with each new day, with every new rise of the SON in our hearts? 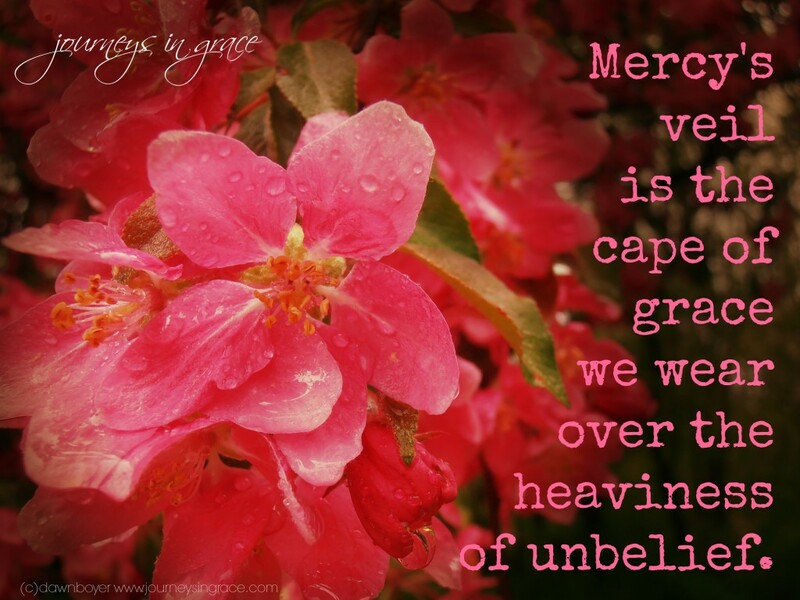 Mercy’s veil is the cape we wear over the heaviness of unbelief. Lamentations 3:22-23 reminds me of the power of his faithful mercy. It is one of those garments we need to remember to take with us and bring out when the cloak of unbelief slips smoothly upon our shoulders. In response to the lies that get a foothold, the cape of mercy quickly repels the storm that deceit rains upon our souls, keeping the soil of our hearts fertile and receptive to the seeds of grace. Mercy takes faith, friends. As we pull this special cape out of our arsenal of grace-armor we need to exercise our faith muscles to put it on daily. Do you realize that though He extends mercy every day, we have to reach for it in order to be clothed in it? Mercy shows us the effortless bounty of grace in unending proportions. The beauty here is that mercy says earthly math is miscalculating, because it can limit. Yet heaven’s mercy is like a running faucet that only stops when it is turned off. The glorious hope here is that the spigot of heaven is graciously controlled by the Hand of Love, and it is turned on over us every single day. Unbelief is like the enemy of our souls, it robs, steals, and destroys; but Luke 10:10 reminds us that Christ came to give us abundant life in response the thievery of the deceiver. The thief comes only in order to steal and kill and destroy, I came that they may have and enjoy life, and have it in abundance (to the full till it overflows). ~ John 10:10 Amp. Mercy is a necessary piece of our wardrobe friends. It starts with the encouragement of what others see in us. As we are willing to see the glass half-full, touching the tender heart of mercy, we also begin to see His constant faithfulness to us. I invite you to join the conversation about wearing grace and removing that cloak of unbelief from taking space in our armoire with Tarissa and I below. What does it look like to exchange the cloak of unbelief for the cape of mercy to you? Do you think it is harder than it sounds? Or do we rest deep in the shadow of His grace in order to learn how to dress ourselves for the day? It shouldn’t be so hard, should it? I mean… dressing ourselves is one of the first things we do as children. The covering is often clumsy at first, but we get it. We fumble with the buttons and we sometimes miss the proper garments for the outfit, but we can always throw a cape over the top to give us that extra protection from the wind. I see this in the mercy covering He places upon us as we come to him. I see it in the gentle way you share grace with others, the way you share His hope in your words. The way you take time to let your quiet gentle voice be heard, to be vocalized. You don’t realize the impact you are making, the power you are sharing in the communicating you do, but it is there. It is real and it is deep. It draws others in and lets us get a glimpse into the profoundly joyful heart of the meek and quiet soul. Mercy shows us the essence of a meek and a quiet spirit, one I so long to let linger within my day. A gentle spirit that imitates the Savior’s approach to loving us fiercely. You wear this garment, so lovingly cascading upon the frame of your person and it flows in waves touching lives unknowingly. When your quiet song meets the booming heart, it melts the icicles that boldness tends to freeze as words drip freely; excess which warrants melting to reach the inner heart. There is a need for these melodic refrains of whispers upon our souls and that is the gift of God in you. Gentle mercy, quietly playing a melody on our soul leads us to reach for the cape of mercy which is woven by love and place it not just upon our own shoulders, but also upon the shell of those we meet with the simplicity of a word caressing the ear of a soul in need of grace. My prayer for you today, friend, is that you would be aware of His generous mercy, that you would feel the strength of His arms surrounding you and holding you close to His heart… guarding you and enclosing you deep within the walls of His own heart. I’m really looking forward to having this conversation with you about learning to wear a garment of grace. As I’ve thought about your series, I’m reminded of the several times in the Bible we are encouraged to “put on” spiritual attributes. There’s such an intentionality in the act of clothing ourselves. I really love the way you referred to these as topics we can “hang in the closets of our hearts.” I want the closet of my heart to be FULL of Jesus, of His grace, of His love, and of the Word of God! It’s interesting, because I’m currently in the process of cleaning out my physical closet which is overflowing with years of accumulated clutter. My one word for this year is simplify and feel a strong desire to get back to basics in every area of my life. In the process, I’ve been feeling a leaning in my heart to clean out spiritual clutter – old ideas and hurts I’ve outgrown and no longer fit the woman I am today. So, the timing of your series and the topic really speak to where I find myself in my personal life and in my relationship with God. The topic from your list that jumped out the most to me is unbelief. I’ve struggled with unbelief a lot in my spiritual life and still do. So, with this soundtrack of “You’re not good enough.” playing on repeat in mind, it hasn’t always been easy to believe God when He says, “There’s nothing you can do to separate yourself from my love!” One of my favorite verses has always been Romans 5:8: “But God demonstrates His own love for us in this: While we were still sinners, Christ died for us.” I need the daily reminder that God LOVES me IN my imperfection and wants a relationship with me SO much that He sent His Son to die in my place. In those passages, I saw four potential responses to God’s promises and I could relate very much to the first three — the ones Abraham didn’t choose — 1) focusing on my own inability; 2) being overwhelmed by seemingly impossible circumstances; and 3) tiptoeing around, asking cautiously skeptical questions. But the response I want to have is the fourth response — plunging into the promise! That day in November, when I was reading these verses, I was reminded of the many times I’ve gone to the pool with my children. When we get to the pool, my girls always ask me if the water is warm or not. So I dip in a toe and give them a report. When I tell them “The water feels great!” all three of my daughters have different responses. My oldest is cautious about believing me. She sits down on the side of the pool and sticks her feet in, testing out the temperature for herself. My youngest is completely skeptical. She questions me repeatedly before going anywhere near the pool. “Are you sure it’s warm? You aren’t trying to trick me, are you?” My middle daughter on the other hand, believes me immediately. She trusts me and knows that I’ve never lied to her in the past about the temperature of the pool. So, she jumps right in! This is exactly the kind of response I want to have towards God. Jumping right in, plunging into the promise, sure that God will make good on what He says! Trusting when He says that His grace is sufficient and His power is made perfect in weakness. Once again, I thank you for letting me share some of the precious conversations I have had with friends about grace here. I hope they will encourage you to wear grace in your every day, to clothe yourself with the veil of mercy as a cape of grace for the day ahead, and to trust in the faithfulness of God as he supplies our covering. A huge thank you to my sweet friend, Tarissa, who took time to ponder grace with me here. I am praying for a fresh revelation of His mercy and faithfulness to be found as you go to your closet and put on grace. Now it is your turn to participate in the conversation! The next challenge we need to take together in our journey towards grace-filled living, is to reach for the veil of mercy, ignoring the deceiver’s taunts which fill us up with unbelief and the not-enough ideas that keep us from seeing His grace as our every day accessory. Step five: Let the mercy of God caress and gently float upon your shoulders, veiling you in His love so that unbelief cannot gain a foothold in your lives. Then share that with someone else, today. Like the new mercies He gives us each day, let your words be the beginning thread that is woven into the heart of another who is needing the reminder of His bountiful mercy today. Don’t let the thief rob you of that valuable covering. How has His mercy met you in the morning, preparing you for the day ahead? Have you seen the hand of the enemy destroying the hope walls that Christ has built up within you? How can we wear the veil of mercy as a protection against the barbs of opposition to His Truth within us? Christ links unbelief to a hard heart (Mark 16:14) -something we must be diligent to guard against. I love the story of the desperate father who brings his demon possessed son to be healed in Mark 9. Christ challenges him on his use of the word “if” to which the man cries out, “I do believe; help my unbelief.” This desperate cry I often repeated in my own heart… help my unbelief! It is interesting you share that story, Jen. I have spent a lot of time studying it, with deep desire to grasp the lesson He wanted us to learn in it. When the disciples were questioning their failure in prayer, Christ’s answer was even directed towards them, not just the father. And it was the unbelief that was holding back the healing… it was unbelief that limited the power of God in this situation. It was a humbling realization for me, but it is His mercy to reveal those truths, too. In His mercy He always shows us the way. This has me thinking, deep. I too have wrestled with unbelief, more times than I care to admit. I had never thought of Mercy as a garment, but it is empowering to put it in that context. Thank you for this today- this conversation about grace and mercy is life giving! (visiting from Holley Gerth’s today). I am so glad you were able to stop for a visit, Brandi. The more I think of the power He grants us as we clothe ourselves with His grace and mercy I am humbled and undone by it all. Praying that you will find His blessings as you allow Him to cover you in the veil of His mercy each day! The lessons in grace and friendship here are so wonderful. Thanks for sharing! Beautiful post…good lessons for this mother day..
A while ago, I realized that the armor of God doesn’t fit over our own self-protective armor. I think the cape of mercy is the same way. It won’t fit the way it is supposed to if we continue to wear our superhero cape – what we wear when we fear that we are responsible for everything and everyone. This is a good exchange. I love that even in our times of struggling with belief Christ pours his mercy on us! He truly is an amazing God! Mercy and grace. I like the idea of wearing the veil of mercy. Unbelief is something I struggle with, but God’s mercy and grace are greater. Hi, Dawn! 🙂 Thank you for sharing this discussion with us at Grace and Truth last week. The verse you shared from Lamentations is one of my favorites! And I loved the story from your friend about her girls and the pool water. I, too, want to jump right in to the pool of Trust!